I participated in an email exercise with a friend where you had to send an inspirational email to the person next to #1. The email had two names in it so the person you send to and receive from, is someone that you don’t know. I normally don’t participate in things like this but I thought, I could use some encouragement so I’m sure someone else could also. -‘Fear not, I redeemed you’ - This is enough right here. We were bought with a price and Christ has redeemed us, purchased us back so that we don’t have to live in defeat and most importantly, so that we will live forever with Him. -‘I have called you by name, You are Mine’ - I’m excited about the relationship I have with Jesus Christ. I’m grateful he calls me ‘friend’ and that I am His child. That’s true security in an uncertain, insecure world. -‘When you pass through the waters, I will be with you, the rivers shall not overflow you’ - God says that even when you have situations in your life that may make you feel like you’re drowning, He says fear not, you will stay above water because I am with you. As a child of the King you can have confidence in any situation because God is with you! -‘When you walk through the fire, you shall not be burned nor shall the flame scorch you’ - This portion of the scripture almost made me fall out of my seat - literally!! Hard times will come and trouble is inevitable but as you walk through it all, know that you will NOT be consumed. The prophet Jeremiah writes in the book of Lamentations 3:21-23, “This I recall to my mind, Therefore I have hope. 22 Through the Lord’s mercies we are not consumed, Because His compassions fail not. 23 They are new every morning; Great is Your faithfulness”. God says because you are My child and because of the relationship I have with you, you don’t even have to run through the fire but rather you bad enough to WALK through it! Now walk it out!! 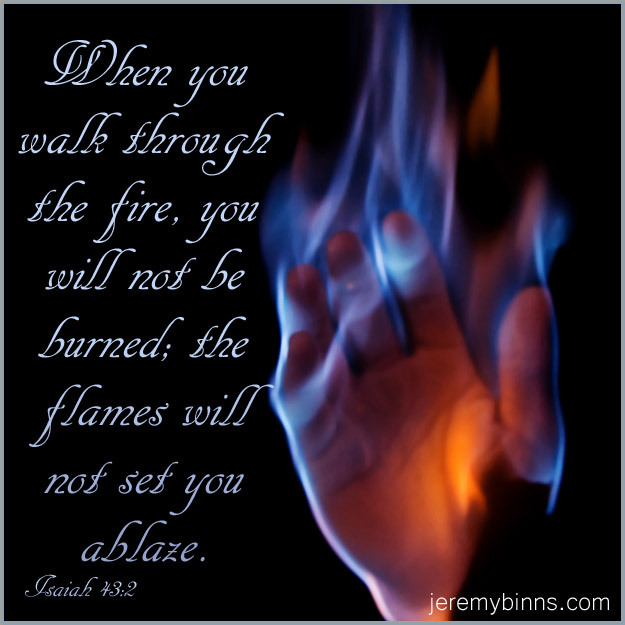 Although you may be in the fire, you won’t be burned nor shall the flame scorch you. In other words: You winning right now, you’re already victorious!!! !